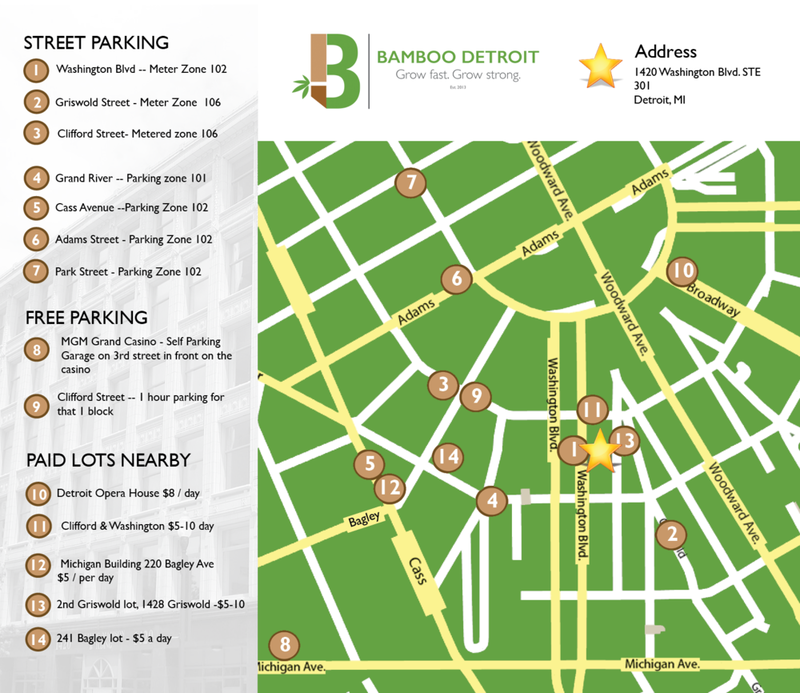 Bamboo is proud to call the historic Julian C. Madison Building our home, an Albert Kahn designed building located at 1420 Washington Blvd. The building is owned by Sharon Madison and it's dedicated to her father Julian C. Madison, a trailblazer in engineering, urban planning, and entrepreneurship. We are just blocks from the new arena, from Campus Martius Park and all the great shopping and restaurants downtown. Our building is programmed to support you with banking at Level One Bank, personal trainers from PT in the D, and meeting space abound. Parking here: Parking is easy! No really, it is. We have plenty of street parking all around us Washington Blvd. Nearby lots and garages cost $2-$10 for day parking. There is free parking about at MGM Casino. We're open for tours Mondays-Thursdays, 9am-5pm. Please email us to book a tour with our team or schedule a tour right now here. Click here to expand the parking map.